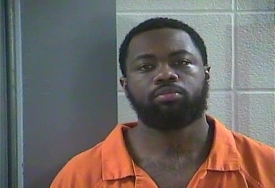 LONDON KY— On 1.27.19 London Police were Dispatched to an alarm at Verizon Wireless located on KY-192. Through investigation, Corey D. Daniels, 33, of Atlanta, Ga. was arrested. Upon the arrival Officers, they discovered that the suspect, Daniels, was still in the building and it was determined that he had made entry through the adjoining business, Mattress Overstock. After making entry into Mattress Overstock, Daniels took off on foot through the store, engaging Officers in a foot pursuit. Daniels was apprehended in the KY-192 Kroger parking lot. Extensive damage was done to the buildings of Mattress Overstock and Verizon Wireless. Daniels was also wanted out of Alabama for a burglary offense. Responding officers were Sgt. Richie Reynolds, Sgt. Gary Proffitt, Ofc. Dylan Hampton and Ofc. Cody Blackwell. Daniels was arrested and charged with two counts of second-degree burglary, two counts of first-degree criminal mischief, fleeing an evading police on foot, resisting arrest, and possession of burglary tools. He was lodged in the Laurel County Detention Center.